Easter Sunday 2013 saw a welcome return to Shoreham by a group of RAF Bomber Command veterans. 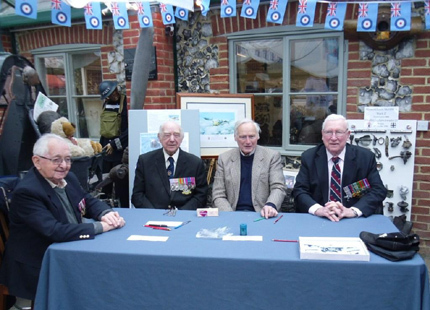 Attending were Sam Brookes (101 Sqn Lancaster ABC wireless-operator), Sid Beaver (207 Sqn Lancaster pilot), Ken Fowler (115 Sqn Lancaster wireless operator) and Harry Irons DFC (158 Sqn Halifax & 9 Sqn Lancaster air-gunner). Their wonderful efforts in meeting and chatting with Museum visitors and signing personal items, made for a most enjoyable and enlightening day; the splendid efforts of our ‘Bomber Boys’ helped raise £300 towards the Bomber Command Memorial Maintenance Fund, so thank you to everyone who came along and helped make the opening day of the Museum’s 25th anniversary year very successful. You are currently browsing the Shoreham Aircraft Museum – News archives for April, 2013.